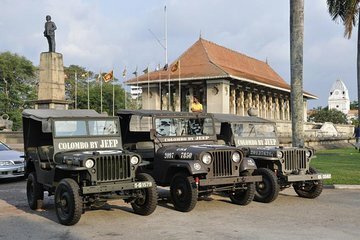 Cruise through Colombo in an open-top vintage Jeep or Land Rover that lets you sunbathe and see your surroundings as you tour the city with a maximum of four passengers. Travel above the traffic and learn about Colombo’s key attractions like the National Museum, Colombo Town Hall, and more from your private guide. Meet your private guide at your hotel in Colombo at your selected departure time of early morning or evening. Hop in your chosen car (select upon booking): a 1942 World War II Jeep, 1945 Vietnam War Jeep, or 1948 Land Rover Series 1 Jeep. Ride through the streets of Colombo with your guide and group of up to four people per vehicle, enjoying 360-degree views of the city as you go. Visit important historical sites, like the Old Parliament and Colombo Fort, as well as natural attractions like the Attidiya Bird Sanctuary. A small car ensures that you can hear your guide’s informative commentary over the din of the streets. Return to your hotel at the end of the tour, with photos and a video of your trip in hand. What a fantastic way to see Colombo. The tour was such great value, our guide was very informative taking us to all the best spots. Highly recommended tour. Amazing tour! Highly recommend for those just visiting and those who live in Sri Lanka. Great fun and great guide! !